The A2|6 driver provided with the device has not worked since Mac OS-X Lion (10.7). I have written a replacement driver which works from Lion to present (High Sierra). Please note, this driver is for the A26 device (2 inputs 6 outputs), not for the A62m. A driver for the A62m can be found here. Download the archive from this link. When expanded it produces an A26 folder containing three files. Make sure the folder’s name is “A26” exactly. If it is not, rename it. Also ensure the A26 folder is on your desktop and not somewhere else. A step below expects to find it on the desktop with this exact name. (You may remove the folder after successful installation). 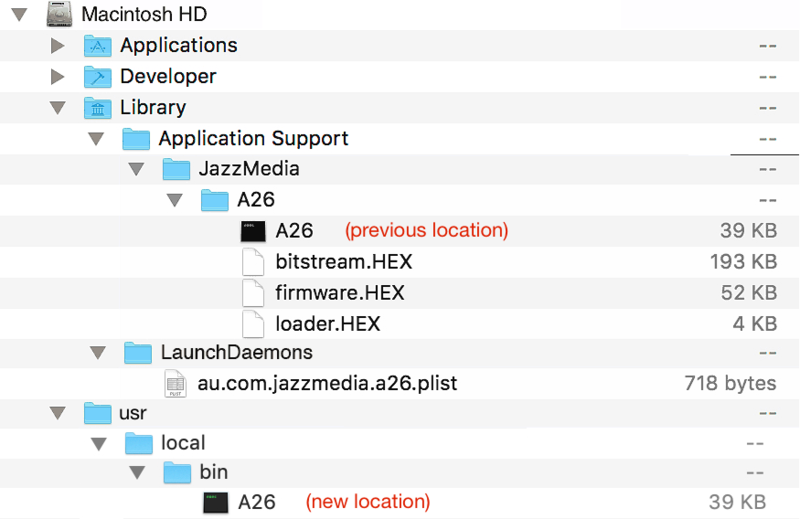 The .HEX files shown in the above image are the firmware for the A26 device. These files are copyright, so I have not included them in the zip file. They are not hard to find on the internet, for example here. If you use the above link, click on the 'Download' icon near the top-right of the page (the down-pointing arrow). This will download an emi26.zip file. Open (expand) the zip file, and you will find three ".HEX" files. Please note, this website has changed its interface in the past. You might need to modify the above instructions to obtain the files. (Alternatively: the three files can also be found here, however you need to click each file in turn, then click the 'raw' button, and then save the raw page into a text file. Repeat for each file). That's it. No need to reboot. You will need to plug in your A26 before the driver will load. The driver can take several seconds to upload the firmware. Between 10 and 20 seconds is typical. You can use the Sound Control Panel to check that the firmware has been uploaded successfully. Please follow the instructions carefully. Here's an FAQ which may also help.